AYC KF1102 Economic Styling Station. 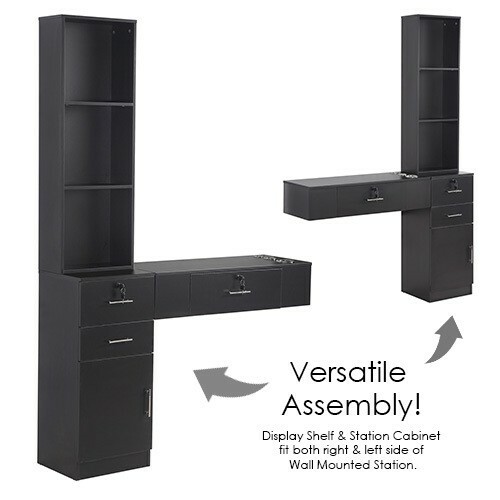 This versatile Economic Styling Station is ideal for any barbershop or hair salon looking for a simple way to personalize their workspace! The station includes a display shelf with three large cubby holes, wall mounted styling station with one large lockable drawer, and lockable station cabinet with large pullout drawer, small pullout drawer and storage cabinet. 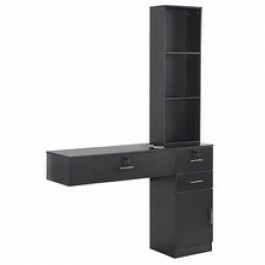 Three appliance holders are built into the workspace to safely secure your professional salon tools. Available in a Dark Espresso or Black engineered hardwood, complimented with modern steel drawer handles.